Walker was designed from end-to-end to provide an exacting quality for the demands of professional use. A massive library of over 25,000 samples was meticulously recorded at the prestigious Technicolor Sound Stage in Paris, France and edited for precise and reliable playback. Each sound was recorded with 3 matched mic pairs placed near and far, exposed and selectable within the UI, including Schoeps CMC6 (small-diaphragm cardioid), Neumann U87 (large- diaphragm cardioid) and DPA 4006 (omni-directional). 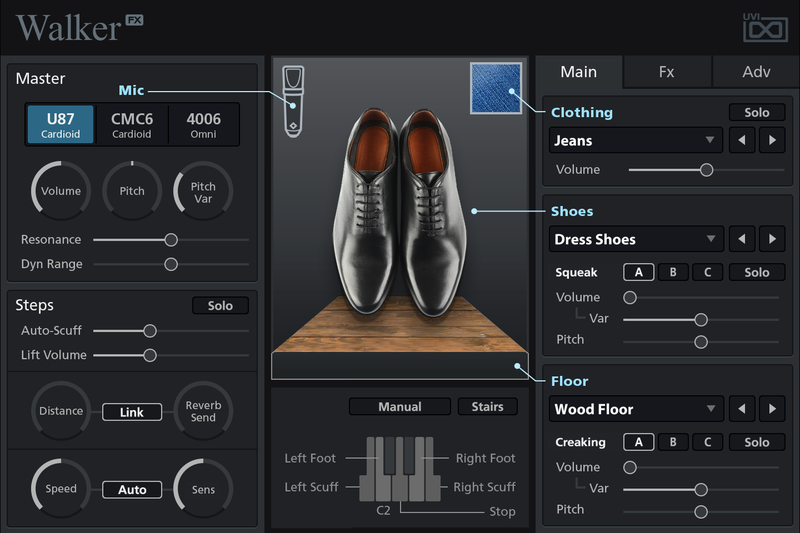 A comprehensive and fully-customizable software solution for creating realistic cinema- quality footsteps and feet foley, Walker provides complete sound customization, smart- automation and exceptional sound quality in a convenient and easy-to-use package.